Sodium nitrate and sodium nitrite are two food preservatives with very similar chemical formulas, but different properties in the body. Sodium nitrate, with the formula NaNO3, helps prevent bacterial colonization of foods. 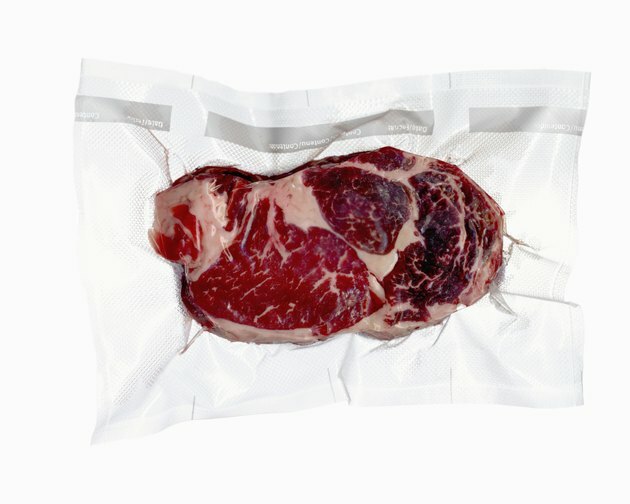 Sodium nitrite, with the formula NaNO2, is a strong oxidizing agent used as a meat preservative. The two compounds have different uses outside food. According to the "CRC Handbook of Chemistry and Physics," sodium nitrite is a solid white salt that decomposes at high temperature. It's a powerful oxidizing agent, meaning that it can take electrons from other chemicals. Because chemical bonds are made of electrons, oxidizing a chemical often causes it to react, fall apart, or rearrange. This is the basis for sodium nitrite's utility as a preservative--it oxidizes molecules of life in bacteria, preventing the bacteria from colonizing food. The "CRC Handbook of Chemistry and Physics" explains that sodium nitrate is also a crystalline white powder, but that it is more heat stable than sodium nitrite. Like sodium nitrite, it's an oxidizing agent, and when it oxidizes a chemical, one of the products of the reaction is sodium nitrite. As such, adding sodium nitrate to food is tantamount to adding sodium nitrite, particularly because the gut creates conditions for conversion of nitrate into nitrite. Aside from acting as a food preservative, sodium nitrate has utility in several other applications. It's more commonly called "saltpeter," and is one of the main ingredients in gunpowder and explosives. Nitrate salts also have applications as chemical fertilizers, since they provide sources of nitrogen to growing plants. Industrially, it's used to make nitric acid, explain Drs. Penny Le Couteur and Jay Burreson in their book "Napoleon's Buttons." One of the problems associated with nitrite salts -- and therefore nitrate salts, since they're converted to nitrite salts -- in food is that the nitrate salts can react to form compounds called nitrosamines, which are carcinogens. Nitrosamines form when nitrites react with other nitrogen-containing compounds called secondary amines, which are the major constituents of proteins. Since nitrites most often occur as meat preservatives, this means that nitrite-cured meat contains the necessary ingredients for nitrosamine production. In general, the American Medical Association has found that the concentrations of nitrites in normal quantities of preserved meats aren't sufficient to cause cancer. However, they also report that nitrites lead to formation of modified hemoglobin proteins, where hemoglobin is the structure in red blood cells that carries oxygen to the tissues. When nitrites modify hemoglobin, they produce methemoglobin, which isn't able to carry oxygen. This can lead to cellular oxygen deficiencies. Is Sodium Acid Pyrophosphate Dangerous?